Ok, I’m going to admit that trying to acid stain concrete countertops has taken longer than I expected. It’s not because the process was long or anything, but after I started I ended up having sinus surgery which made me have to stay away from sanded concrete and the fumes until everything healed up nicely. Now that I’m all better and finally all finished I have this amazing diy acid stain concrete countertops project I want to share. I got tired of looking at our plain old bathrooms and decided it was time for a change. 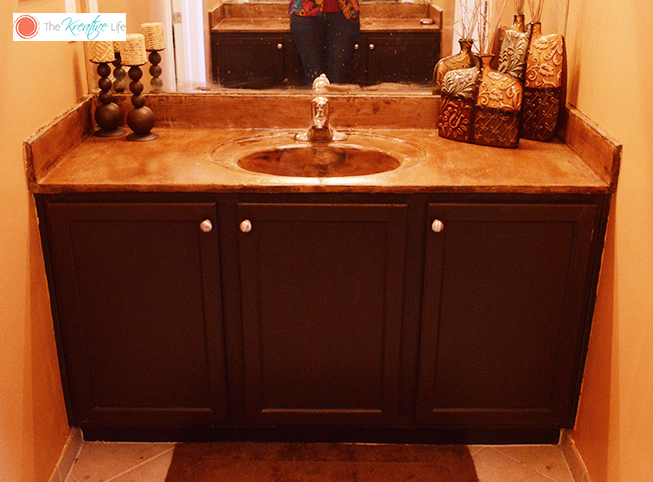 I completed this bathroom cabinet project first and then moved on to the countertops. I loved how it turned out and the color is gorgeous! 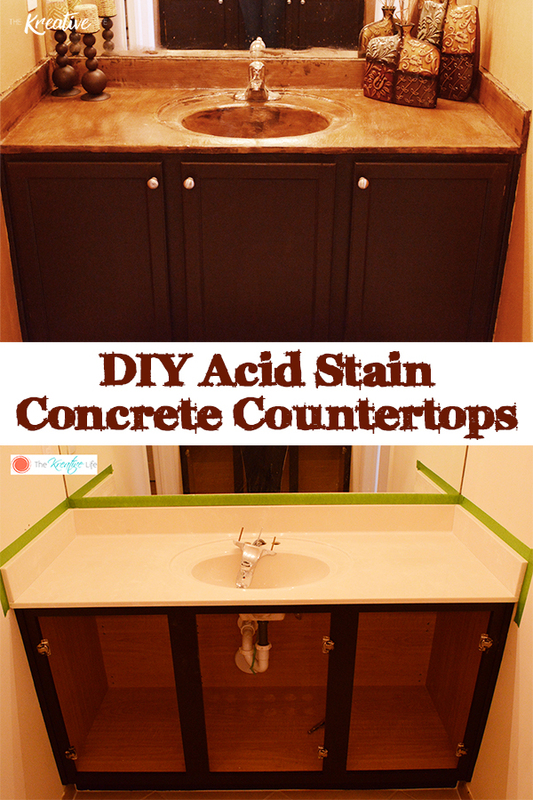 Here’s my step-by-step for my diy acid stain concrete countertops for my bathroom and I’d like to thank the great people at Concrete Coatings for sponsoring today’s post. Enjoy! *Always wear gloves and a face mask. Work in a well-ventilated area. Turn off water to the sink. 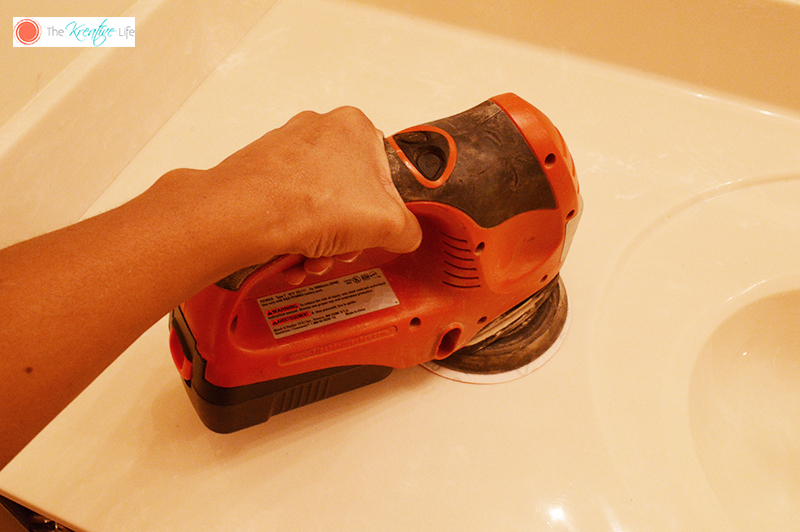 Remove faucet fixtures. Line the walls near the countertop with painters tape. I removed the cabinet doors because it was easier for me to access the plumbing and I didn’t want accidentally getting any stain on my newly finished doors. Using the orbital sander and 150 grit paper, sand down the countertop to remove the shiny finish. This gives the concrete a rough surface to adhere to. Pour your desired amount of feather finish concrete into the mud pan. Slowly add water. I added a ½ cup at a time and constantly mixed until the consistency was like batter. 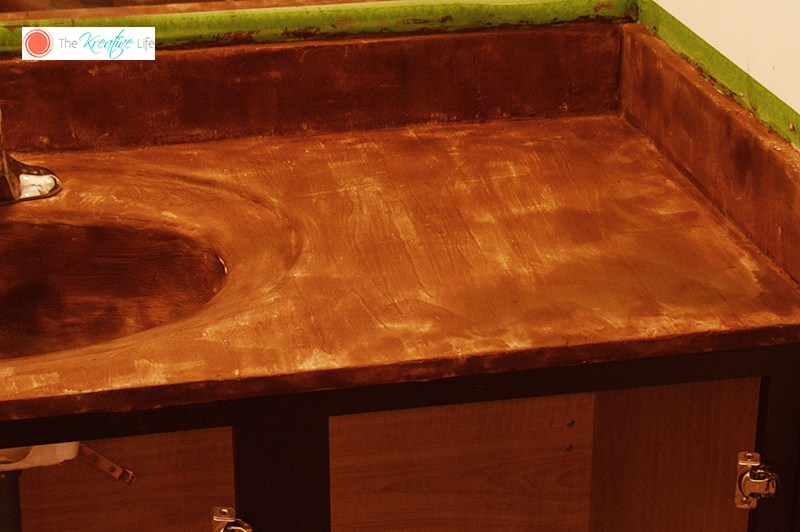 Using the plastic trowel, add a thin layer of concrete to the countertop. It will look patchy and uneven at first. Get into the corners with the edge of your trowel. Allow the first layer of concrete to dry. 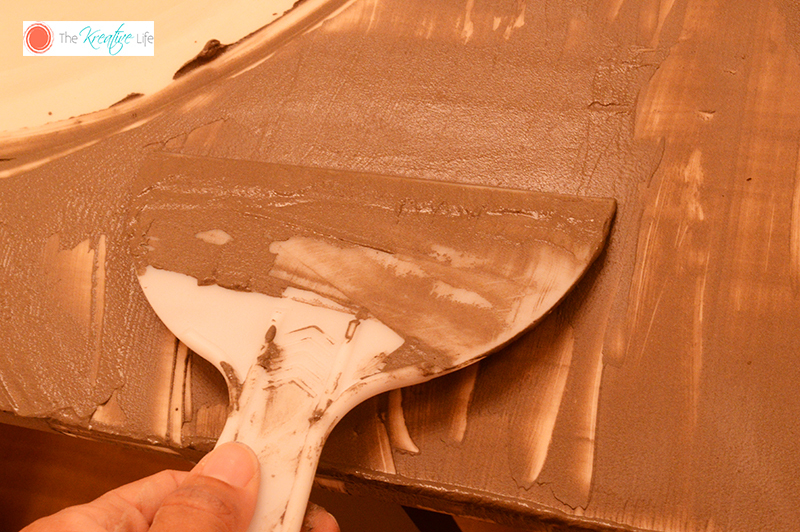 Apply the second layer of concrete, making sure it fill in any uneven spaces. Allow to dry. 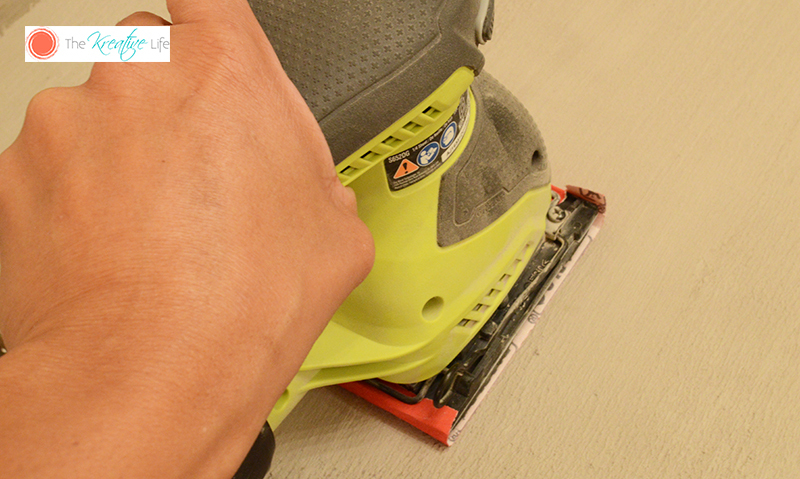 Once the concrete is dry, use the ¼ Ryobi sheet sander and 220 grit paper to make the surface as smooth as possible. I’m going to admit that I didn’t do a good job smoothing it out the first time, so I had to sand it down some more. There are a few striations left, but it still looks nice. 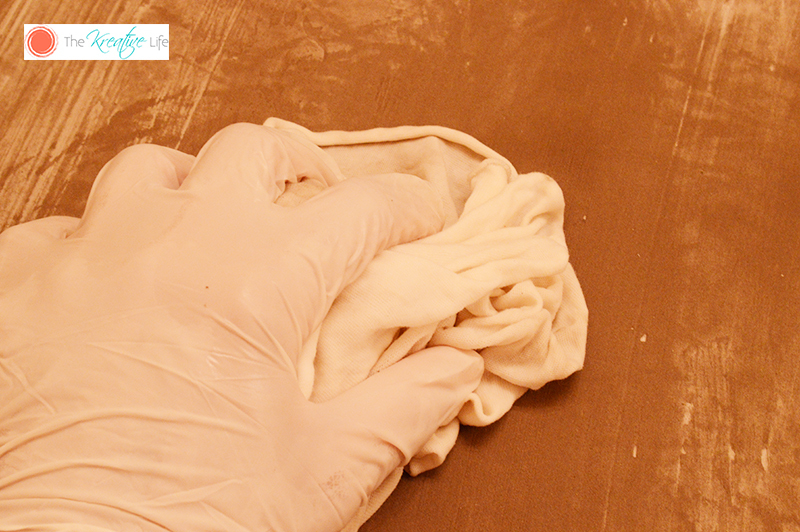 Using the damp cloth, add moisture to the sink. This will allow the acid stain to settle into the pores of the concrete. Add your desired amount of Concrete Coatings VIVID Acid Stain to your empty spray bottle. If you choose, you can dilute the acid stain with water if you want a lighter color. You can also mix colors from their line, if you choose to. Evenly spray the acid stain over the concrete in small sections, making sure that the solution doesn’t puddle in areas. 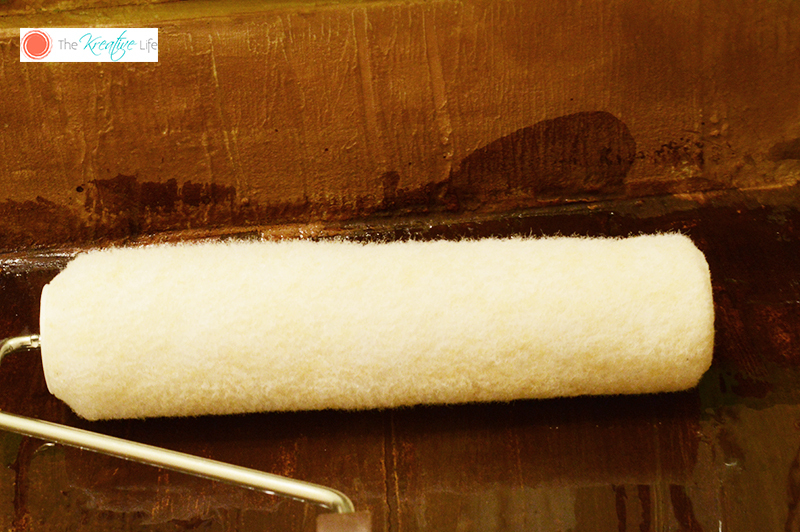 Quickly use the small roller brush to spread the stain over the concrete before moving on to spray the next section. 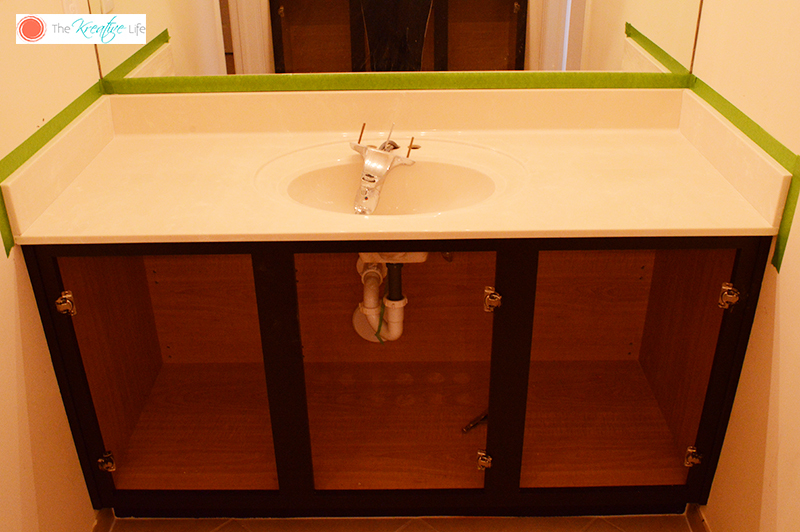 Continue this process until the entire countertop is stained. 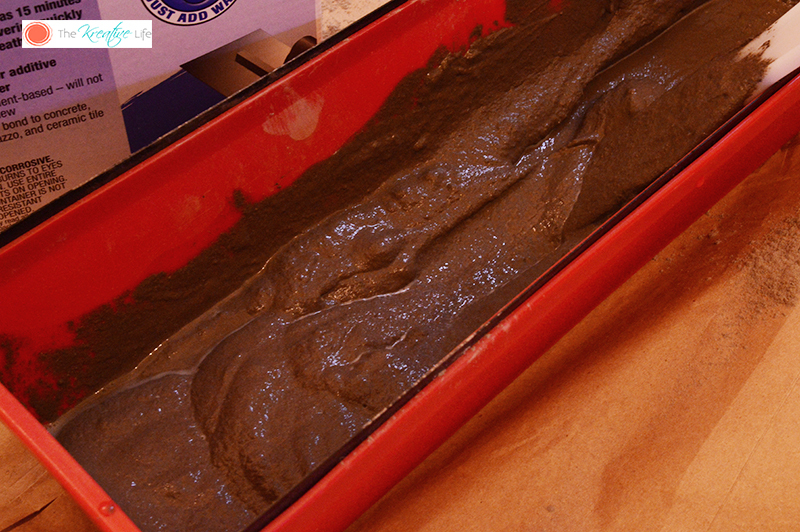 Allow the stain to dry and react to the concrete, according to the time on the container. I waited at least 4 hours. 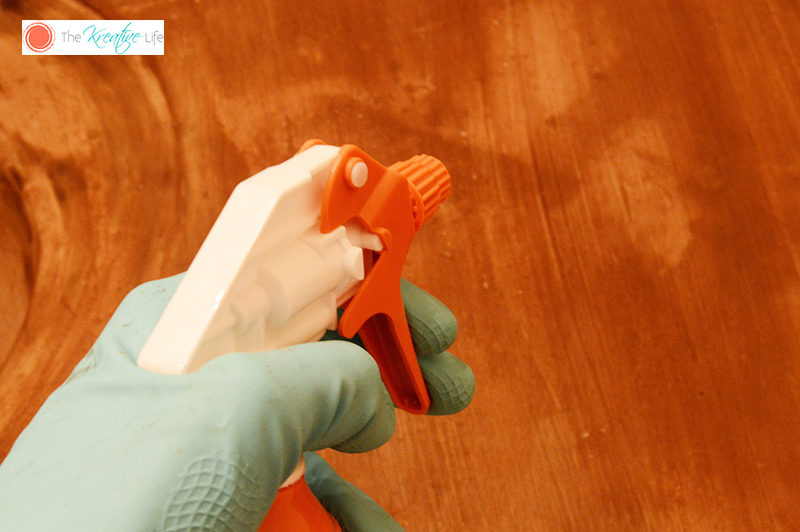 Using the ammonia/water mixer, spray the counter to stop the reaction between the concrete and stain. Once dried, use a non-harsh liquid soap and water to remove any remaining residue. Allow to dry at least 24 hours to ensure all moisture is gone. Using the Concrete Coatings Super Seal 2000 Acrylic Sealer and the larger roller brush, evenly spread the sealer on the countertop. Allow to dry. If the sealer doesn’t take in certain spots, then respray those spots with the ammonia mixture and allow to dry. Reapply sealer. Allow the countertops to dry for at least 24 hours before reattaching faucet and turning back on the plumbing. 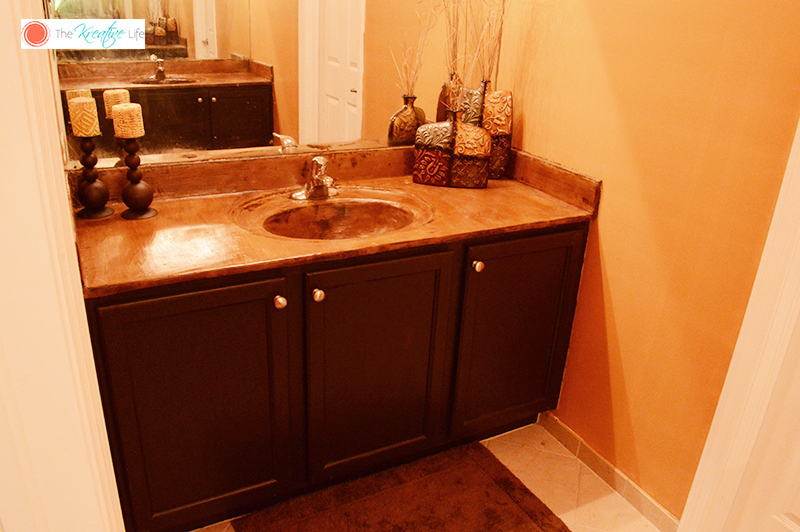 Enjoy your beautiful new diy acid stain concrete countertop sinks! If you liked this diy project, you may like my diy pvc canopy, decorative wood stain table, and diy floating shelves. Wow, this is a really pretty finish! I had no idea this was something you could do, but I really like it. It doesn’t seem like it is too difficult to do either. I think I could actually handle it! It actually is pretty easy. The hardest part was waiting 24 hours before we could use it. Wow love the before and after! You did such a great job. I think even I could do this. That was pretty awesome! I’ve never done a project like this before, you make it seem so easy. I love the outcome and how you’ve styled it after. This looks great! I love to try new DIY projects like this that can totally change the look of the room. Great job! Hi, Kait! It really does give the bathroom a whole new feel. this is a great idea! looks like a lot of fun while doing it plus it’s not that too hard to do it. this is really an awesome idea! Hi, Kelly! It was a lot of fun, especially waiting to see how the stain would interact with the concrete. what a great prject! i wish i could make something like this at home! very unique and very nice idea! That is such a cool way of upgrading your counters. I will have to try this in my bathroom! This turned out beautifully! I’ve always had mixed feelings about concrete counters, but I saw it done on a recent episode of Flip or Flop and loved it! This looks so pretty! Wow! That looks gorgeous!! I would love to do something like this in my bathrooms. I am enlarging my center Island which has a formica countertop that I will be adding piece to and then doing a countertop like this. Can I use the same sealer you used, or do I need to find something different? I can’t wait to get started on this project!! It looks pretty cool!!! Hi, Kaisai! After applying the concrete to the countertop I don’t see why you shouldn’t be able to use the same sealer. I still would suggest to contact the manufacturer to see if this sealer would work or if they have another that would work better for your project. What I would love to see is a close-up of the finished countertop, so that one could see more of the texture and final finish. Hi! I’m planning on doing an update of this project in a couple of months so I can share how it’s holding up. I’ll include close-up pictures then. This does look great! I wonder how did you add the concrete to the sink & get it so smooth? Hi, Cheryl! I sanded the countertop before applying the concrete. The directions show the types of sander and the grit for the paper I used. Beautiful! What was the original countertop material? Will this work with Formica? I’m considering using this method on my kitchen tops. How waterproof and scratch resistant is it? Will steam at a dishwasher affect the finish? Hi, Anna! I think the original countertop may have been some kind of polished stone and acrylic. It may work on formica, but I’m not sure. My counters haven’t scratched yet and the last step in the process is the sealant to help keep moisture out. This looks fantastic! I would love to try this. Your sink and counter top is one solid piece. I have a laminate counter top and the sink is porcelain coated metal. (maybe?) I’m not sure how to handle that. Coat the sink and all? or leave the sink? 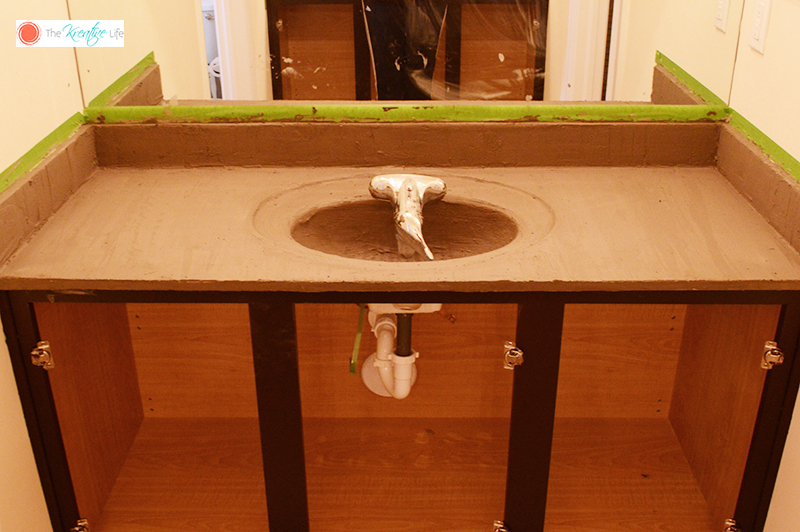 Do you think the concrete would adhere to the sink? Also, how is your new surface to clean? What kind of cleaner do you use on it? Very nice! Do you think this product would hold up in a kitchen sink with the hot soapy water, draining pasta, etc? Hi, Ann! 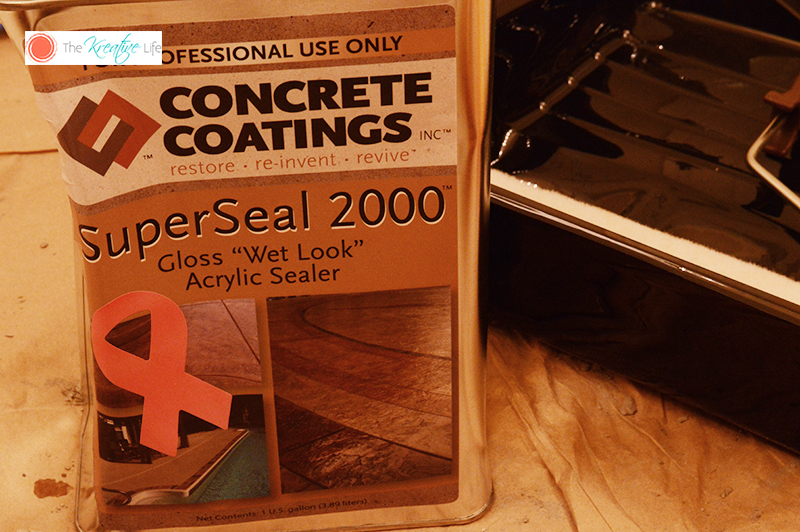 The sealant should keep any moisture out, but you may want to contact the manufacture to get more info. Hi, Barbara! I don’t see why not. You’d still have to sand the tile before applying the concrete. The manufacturer may have more info about applying over tile, though. Excellent article! I like the contrast the acid stain creates. Thanks for writing! I hope you are well after so long after the surgery. The countertop looks amazing. Does any of the products you used for this DIY have a strong smell? I’ve used one product with amonia a few months ago and we’ve had to go out for the rest of day because the smell was so strong for the kids. Great DIYing … well done. Hi, Adrian! Thank you! The smell was pretty strong on the sealant. I did these while my kids were at school and had to have the windows open and a fan blowing.